We utilize a state-of-the art digital intraoral camera to capture images of your teeth, gums, and other structures in the oral cavity. The camera is lightweight, easy to use, and allows us to take multiple pictures in less than a minute. It is painless and easy for the patient. 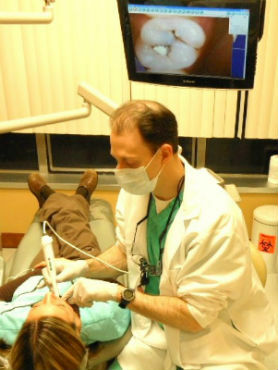 Dr. Calcaterra taking a photo with the intraoral camera. This patient has a large cavity that she will be able to see! Patient Education: many patients are glad to be given the opportunity to see “what the dentist sees.” It allows our dentists and hygienists to show problems that are frequently best shown visually. This makes our dental treatment recommendations much easier to understand. Remember, a picture is worth a thousand words! Patient Records: the images from the camera allow our dentists and hygienists to document and track the progression of problems over time. Problems such as gum recession, dental decay, the progression of small cracks and fractures in teeth, before and after pictures from teeth whitening, certain oral pathological conditions, etc. are all able to be documented and tracked by photographs and stored on our secure servers. Specialist Communication: just like our digital radiographs, we are able to provide our intraoral pictures to the specialists with which we work. The specialists view the images and consult us as needed. This allows for better communication and treatment coordination. Case Presentation: for larger cases, we utilize both intraoral and extraoral photographs to show before and after pictures. Patients and prospective patients are then able to see how modern dentistry can rid themselves of dental disease and achieve their dream smile! Drs. Nicholas and Carla Calcaterra use the intraoral camera routinely as do our wonderful hygienists Crystal and Toni. We will be more than happy to take pictures of your teeth and soft tissue to show you what we see!